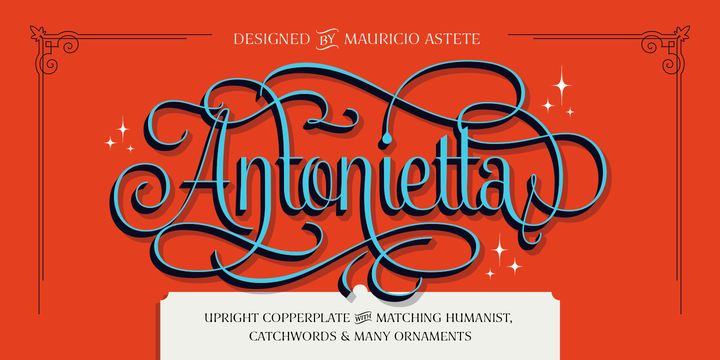 Antonietta is typeface created by Mauricio Astete Brito and published by Latinotype which comes in 7 weights and a wide range of OpenType features. Inspired on Copperplate calligraphy with a touch of lettering & few glasses of wine, it was speciallly designed for brands & labels. Also it is suitable for display, invitation, wedding etc. Have fun! Price: starting from $29 for one font to $159 for all 7 fonts. A font description published on Tuesday, December 13th, 2016 in Fonts, Latinotype by Alexandra that has 2,339 views.